Now that the “shock and awe” of Senator McCain’s pick for his vice presidential running mate begins to subside, many are left with little more than “huh”? If John McCain truly feels that Sarah Palin is the absolute best candidate available from his republican list of contenders for VP, and that she stands ready and able to step in as president should the 72–year-old Senator become unable to perform his duties as president, well so be it. That doesn’t say too much for the rest of the viable candidates, but the choice has been made. Focusing on Palin’s views on energy policy, climate change and the environment seems to put her at odds with McCain on these issues. At least at one time, but apparently no more. Palin is an enthusiastic advocate of drilling in ANWR and offshore, while not that long ago McCain was opposed. Palin dismisses renewable energy as “at least a decade away” showing her abysmal lack of knowledge in the potential for economic growth from the “green” sector as well as the almost daily technical advances in renewable energy. Palin fails to mention the fact that the production of oil from ANWR or offshore is what would actually be at least a decade away. On these points alone she engenders a vast lack of credibility on energy issues. In fact, Sarah Palin represents a disaster in terms of energy policy. She is neither forward-thinking or displays any awareness whatsoever of the realities of our energy economy or how to go about building a new one. That sums up the “leadership” Sarah Palin brings to the Republican table in terms of energy policy. “ …I’m not one though who would attribute it to being man-made.is one of those who happens to believe that global warming is not caused by man”. Hopefully at some point in the campaign, Palin will be asked on what she bases that opinion. On what foundation does Palin attribute her views on climate change? Can she discuss the science laid out by the National Academies of Science, NASA, the National Oceanic and Atmospheric Administration’s Climate Program or the IPCC? Or is Palin’s grasp of the science centered around what she hears on Fox News? She should be made to make her position clear and how it is she has analyzed the available data to come to that position – if she has studied any data at all. To simply say she believes human activity “plays no role” in climate change is not enough. She needs to explain herself, if she can. Sarah Palin is no environmentalist. I suspect she’s rather proud of that. Under her leadership, the State of Alaska has sued the federal government on its decision to list the polar bear on the endangered species list. Palin claims that polar bear populations are increasing, sounding ominously like a Wall Street Journal or Fox News sound bite. Can she cite her sources on this claim (besides the aforementioned)? Has she talked to any wildlife biologists studying polar bear? Does she have the slightest idea what she is talking about? She claims that she bases her opposition to the polar bear listing on a scientific review from the Alaska Department of Fish and Game. Oddly, for Palin, documents released through a Freedom of Information Act request show state biologists agree with Interior Department findings about polar bear habitat. In fact, since the mid-1980’s the polar bear population in Alaska’s Southern Beaufort Sea has declined 20%, according to a peer-reviewed study by the U.S. Geological Survey. Stirling has studied polar bears for 37 years, longer than anyone. Palin was 7 years old when he began his research. Palin sees the environment purely on terms of how it can be exploited. At all costs. She defends the aerial hunting of wolves and bears in Alaska, a practice that was banned by the federal government in 1972, yet, under Palin’s leadership, a law that Alaska manages to get around to this day. Palin is a disaster on the environment, waiting to happen. If we allow it. Supporters of Palin point to her standing up to special interests in opposing the so-called “bridge to nowhere” that was to be built near Ketchikan, Alaska. And that is exactly what Palin offers the country in terms of energy, climate change, and environmental stewardship – a Bridge to Nowhere. As an Alaska resident I’ve watched her in action. As a wildlife biologist I vote for who I think is going to work hardest to protect our fish and wildlife. Sarah Palin may like to snowmachine and hunt for moose, but she is anti-environment when she has to choose between fish & wildlife and big polluting mines. Here is the proof. Gov. Palin recently came out against Alaska ballot measure 4, a clean water initiative. It is illegal for the governor to take sides on a ballot initiative, but she did anyway, probably breaking the law. Her Department of Natural Resources web site had an information page that was clearly against measure 4, and they were forced to take it down. Measure 4 was aimed at stopping the huge Pebble mine project, which scientists believe has a very high probability of polluting the watershed that drains into the largest salmon producing river system in the world. It will be the largest open-pit mine in the world. Palin’s illegal stand against ballot measure 4, and the millions of dollars of misleading advertising by the two foreign mining companies behind the Pebble, who have a terrible track record of pollution, helped the initiative fail in last Tuesday’s election. The Pebble mine, if allowed to proceed, will likely become Alaska’s worst environmental disaster. The scope of this project is just unbelievable. Even the Juneau Empire (owned by a conservative Georgia newspaper chain) came out in favor of last Tuesday’s ballot measure 4. Ballot measure 4 was an attempt to bring back the clean water regulations that were in effect before Palin’s predecessor, former Republican governor Frank Murkowski, gutted them by allowing mixing zones in salmon streams. I guess it’s not unusual for someone who doesn’t believe in evolution to not give a damn about the environment. Sarah Palin has been on TV in the last few days using the term “environmental extremists”. That speaks volumes. I became a life member of the NRA when I was a teenager. Being an NRA member doesn’t mean you are going to automatically work to protect sport fishing resources. And Palin is talking about Joe Biden voting against the Trans-Alaska pipeline way back when. She doesn’t mention the fact that the original pipeline proposal was for 800 miles of mostly buried pipe, much of it through permafrost, which would have been an environmental disaster, and was an engineering folly. I was on the pipeline VSM (vertical support members) drill crew in 1975 that bored through ten-foot layers of crystal clear ice. We drilled holes about 20 to 60 feet deep from Franklin Bluffs all the way to Prudhoe Bay. We saw lots of ice, and the rule was we had to drill an extra ten feet deeper for every ten feet of ice that we encountered. The VSM’s, which hung the pipe high above the ground, used passive refrigeration to keep the ground frozen. They were not part of the original proposal. The original pipeline proposal was irresponsible, and pure fantasy. Joe Biden’s vote against the pipeline, as proposed, three years after environmentalists and Native leaders stopped the original plan, is not surprising. Why trust an industry that, only three years earlier, wanted to bury hot pipe in ice? Joe Biden favored a pipeline that would run from Alaska into Canada and join Canada’s pipeline system to the midwest US, giving us the oil instead of the Asian markets where the oil companies could make a little more money. He didn’t trust single-hull tankers to move all of that oil, so he voted no. He was right about those single-hull tankers; we got the Exxon-Valdez disaster. To this day the oil remains in the sediments of Prince William Sound, ruining the beach sediments and benthic sediments. Thank you for your thoughtful and informative comment. This is the kind of thing people need to hear. Its so nice to read your references and realize that they are based on sound scientific evidence. Its crazy, the past few days. 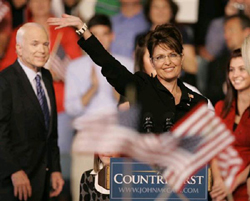 Its not just me who thinks that McCain’s nomination of Sara Palin is insane. Please keep up your work, and keep promoting the truth. Co2 emmisions continue to rise on a daily basis, to levels never seen before in our earths history. Most of these emmisions have been created by man and are a contributing gas responsible to the greenhouse effect therby increasing global temperatures. We know this for a fact because as co2 levels have increased over the past 10 years, we find that global temeratures have risen incrementally to match the co2 increase. But, wait.. uhh… err.. Fact check. THE EARTH HAS BEEN COOLING FOR THE PAST 10 YEARS RUNNING. Stop the craziness! Oh, and John, your little preamble shows how little you know about climate science in any case. Fact check indeed. Ok, Thomas… My sources are under your nimminy piminey nose. Look at the data. A simple question that you won’t answer without a tap dance.. What year since 1998 has been warmer? Check the facts. I’ll give you a hint.. NONE! I understand that you’re likely a lost cause, but I will ask again. Can you cite your sources? “Under my nimminy piminey nose”? Aren’t you embarrassed to sound like a 6-year-old? I’ll make this simple: for starters 2005 and 2007. Maybe 2003. Is that simple enough for you? If you’re willing to actually pry open your mind a bit and consider a real discussion of the point you claim is “right under my nose” and a “tap dance”, then there are sources that do not concur with your assertion (that you have yet to cite) that you may want to at least look at. I can actually come up with the sources upon which you are likely asserting this point, why can’t you even do that much? The thing is I’ve studied this a little bit John. I’ve seen points for and against this. I could argue this with myself and do a better job than to try to discuss it with you. It’s tiring to deal with people that are unable or unwilling to support their viewpoint. Please, if you want to have a discussion about this, try to let go of your mysterious rage and discuss the issue like an adult. Otherwise you’re wasting your time and my time. I can assure you, you won’t change anyone’s mind with the powers of argumentation you’ve displayed thus far. Okay John, it’s up to you. You can let this lie, you can come back with a source and ask a legitimate question, or you can fire back with mindless rage. It’s up to you.